VDOT provides a very useful service for reporting problems. 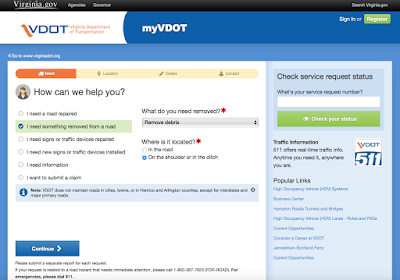 myVDOT is an online form that users fill out noting the problem and the location, using an interactive map. Photos of the problem can be uploaded. See our previous blog entries about myVDOT. In my experience, problems are addressed quickly and feedback on a request is provided in a timely manner. We've asked VDOT to add a way for reporting bike-related problems. We've been told that the system is being modified and that our request is under consideration. VDOT is currently asking users of the system to take a survey on the user experience. This is a great opportunity to let VDOT know that some small modifications of the text will allow cyclists to more easily report problems. If you have a couple of minutes, please take the myVDOT Survey.